I decided to do a simple before and after of the foyer and stairway before putting this project to rest. Not the exact same angle. Here is a view with a slight shift to the left. Here is the before of the left side. The wall behind the chair has nothing on it now and I rather like it that way. Should I find just the right thing, I have a spot for it. 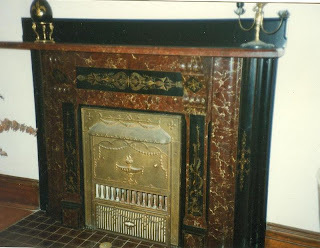 Here is a close up of the previous mantel. And here is the current look. I had this fishnet as a window treatment for the both the window and the door before this renovation. Now a drape of mid-century bark cloth hangs between the window and the door. it was a bit much in this room, with this drape, so I chose this fabric instead. One chair sits opposite each bookcase. Rather cluttered, but still a before shot of the northeast corner. The radiator sits in a small recess where it always did. The only difference here is fresh paint and a new canvas on the wall. This shows the previous lighting. And here is the current lighting. Here are the lights again...on and reflected in the mirror. The mirror replaced this framed print of a Geisha. This will have to serve as a before of the southeast corner of the room. A closer view from the same angle but without the stepladder. This short hall is at the bottom of the stairs and leads to the dining room and kitchen. Here is that view now. This is the new mirror. The previous mirror can be seen in the next pic. From the stairs looking down. The view from the stairs now looks like this. From the foyer looking up the stairs. The new look from the foyer to the stairs. I am still looking for some stunning hooks for the paneled wall. From the dining room doorway looking towards the stairs. The current look from the same angle. This is the stained glass window in the stairwell before the trim was painted. Here it is after the paint. I'm sure there are opposite opinions on this change. I like it both ways but the lighter version does brighten up the stairwell. The last stretch of stairs to the second floor. And the same section of stairs as they look now. If you would like to read more about any part of this remodel, you can find the details by clicking on any of the topics below. The entire make-over is so uplifting and light! Looks absolutely beautiful. What is the canvas on the wall? Map of Paris? I particularly love the lighter trim on the stained glass window. It gives a look of ease and inspiration! Way to go, sister!